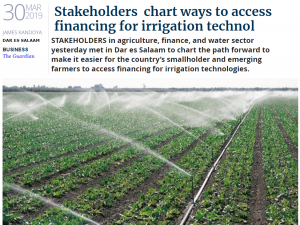 Stakeholders in agriculture, finance and water sectors met yesterday in Dar Es Salaam to chart the path forward to make it easier for the country’s smallholder and emerging farmers to access financing for irrigation technologies. The move aims to improve irrigation efficiency while also expanding the amount of land under irrigation. The consortium, which includes the Financial Sector Deepening Trust (FSDT), National Irrigation Commission (NIrC), Private Agricultural Support Trust (PASS), Rikolto, Tanzania Agricultural Development Bank (TADB), Tanzania Horticulture Association (TAHA), and Tanzania 2030 Water Resources Group (2030 WRG) – a public-private-civil society partnership hosted by the World Bank Group – is establishing a partnership that leverages their combined networks to link smallholder farmers with appropriate financing for irrigation investments. The collaboration supports the mandate of NIrC to strengthen private sector engagement in irrigation through financing, equipment-supply, and co-investment.